Hi guys! Another way of saying thank you for supporting my blog is by having this third part of my 1st year anniversary giveaway. I'm giving away various skin care products to one lucky reader. Just follow the simple mechanics below and wait for the rafflecopter to load. This giveaway is open to PHILIPPINE READERS only. I'll be hosting another giveaway that's open worldwide two weeks from now. I want to thank my dearest cousin Cherry Teruel who's currently based at Doha, Qatar for sponsoring my Makeup and Skin Care Loot giveaway :D If you're reading right now, I'm very grateful for making this giveaway possible. I still have a lot of skin care stuff to empty, so I'm not joining. 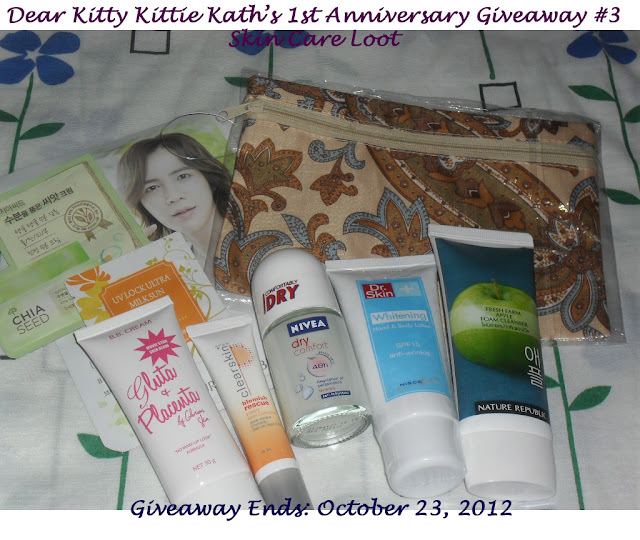 But Happy Anniversary "Dear Kitty Kittie Kath"
congratulations with your blog and goodluck with your giveaways! im joining thanks for this giveaway! Happy Anniversary "Dear Kitty Kittie Kath"